• Adjustable speed and time of depositing rollers. • Reverse cycle of depositing rollers for clean detachment. • Computerized adjustable speed for rotation of nozzles. • Automatic lowering of tray for efficient detachment. 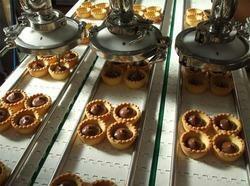 We offer a wide range of Cookies Dropping and Wirecut Machines Model -1, which is fitted with modern functions. A large touch screen panel enables easy and convenient handling. Delta PLC helps in controlling the functions of the machines and provides a lasting impact. Available at economical prices, these models are highly demanded by our clients. Leveraging on our vast industry experience, we are providing a high quality range of Cookie Drop Machine. - Adjustable speed and time of depositing rollers. - Adjustable speed of rotation of nozzles. - Automatic advancement of tray. For our honourable patrons, we offer a distinguished assortment of Cookies Drop Machine. 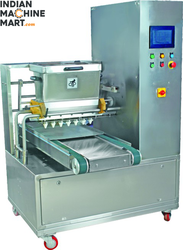 we are offer wide range of Manual Cookie Dropper Machine.